Green Bay has always been a city with a fierce sense of tradition complimented by a friendly atmosphere. Those qualities seem to attract not only living visitors but also spirits of the dead. Tour the city's haunted past with Tim Freiss as he follows the trail of the tragic, the inexplicable and the just plain spooky. From the desecration of the father of Wisconsin's burial spot to the winery that was a stop on the Underground Railroad to the nightclub haunted by a bullet-riddled love triangle, Haunted Green Bay stirs up the kind of history that keeps us awake a little bit longer once the lights are out. You will receive an autographed copy of the book. If you would like the book signed to someone, please put a note in paypal's shopping cart or contact us. This is good for one adult admission to the Green Bay Walking Ghost Tour. After you purchase the gift certificate, we will send you the certificate in a pdf form for you to print off. Please let us know the name of the person or people that will be receiving it. You may write their names (first and last) in the comments when you are purchasing it. 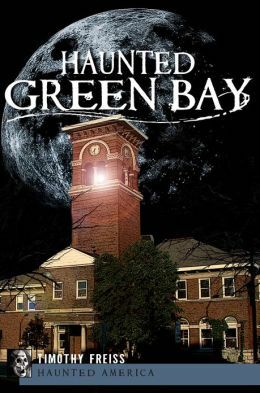 This is good for Two adult admissions to the Green Bay Walking Ghost Tour. After you purchase the gift certificate, we will send you the certificate in a pdf form for you to print off. Please let us know the name of the person or people that will be receiving it. You may write their names (first and last) in the comments when you are purchasing it.